Announcing... the 3-Concert “Summer Series”! All concerts will take place at the Del Valle Theatre in Walnut Creek. Both subscriptions and single tickets are now on sale! Purchase on this page, or call 925-943-7469. For years, our subscribers have been asking for us to present more concerts in Walnut Creek. Also, we are always looking for ways to include more patrons at our concerts, beyond our loyal subscribers. For both reasons, in June 2018 we will try a brand new "mini-series," totally independent of our regular season, of three concerts at our usual level of quality, at attractive "summer-like" prices. Subscribe early for the best seats! Known for their adrenalized performances, original compositions, and notorious music videos, Anderson and Roe are revolutionizing the piano duo experience for the 21st century. Described as “the most dynamic duo of this generation” (San Francisco Classical Voice) and “the very model of complete 21st-century musicans” (The Washington Post), the Anderson & Roe Piano Duo aims to make classical music a relevant and powerful force around the world. Their recent albums on the Steinway Label (When Words Fade, An Amadeus Affair, and The Art of Bach) were released to critical acclaim and have spent dozens of weeks at the top of the Billboard Classical Charts, while their Emmy-nominated, self-produced music videos have been viewed by millions on YouTube and at international film festivals. Since forming their musical partnership in 2002 as students at The Juilliard School, the Anderson & Roe Piano Duo has appeared on NPR and MTV, toured extensively worldwide as recitalists and orchestral soloists, and presented at numerous international leader symposiums. A performance by the Duo was picked to appear on the Sounds of Juilliard CD celebrating the school’s centenary. Highlights of the 2016/17 season include tours throughout North America, Asia, and Europe; appearances with the San Francisco Symphony, the Royal Liverpool Philharmonic, the Chicago Sinfonietta, and more; serving as webcast hosts for the Van Cliburn International Piano Competition; and the DVD release of their ambitious—and literally explosive—music film, The Rite of Spring. Please note that the program this exciting duo will play for us will be composed of purely classical works; there will be no pop or crossover material. TICKETS FOR SERGEY KHACHATRYAN WILL BE HONORED AT THIS CONCERT. Mr. Khachatryan's recital will be re-scheduled for a future date. 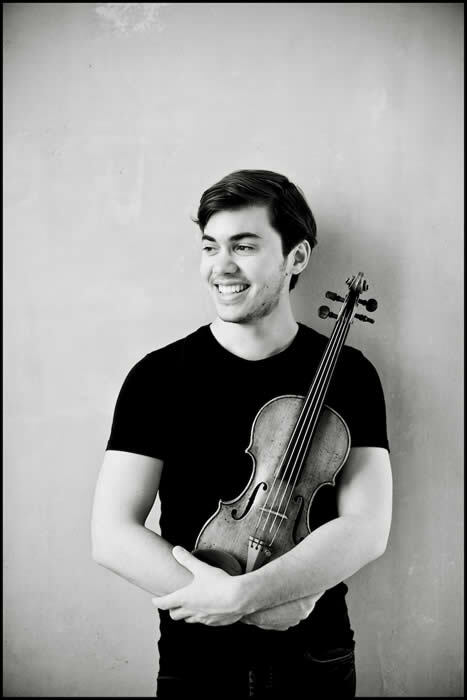 American violinist Benjamin Beilman is recognized as one of the fastest rising stars of his generation, winning praise for his passionate performances and deep rich tone, which the Washington Post called "mightily impressive" and The New York Times described as "muscular with a glint of violence." In March 2016, Warner Classics released his debut recital CD. Highlights of Mr. Beilman's 2017-18 season include performances with the Houston Symphony, Oregon Symphony, North Carolina Symphony, Indianapolis Symphony, and Orchestra St. Luke's, as well as a multi-city tour of California play-directing the New Century Chamber Orchestra in a program including Bach, Stravinsky, and Andrew Norman. In recital, he will premiere a new work written for him by Frederic Rzewski and commissioned by Music Accord, presented by Boston Celebrity Series and Shriver Hall Concert Series, and on tour throughout the US in the 17-18 and 18-19 seasons. Abroad, Mr. Beilman will make his Australian concerto debut with the Sydney Symphony where he will perform Jennifer Higdon's Concerto, and debuts with Scottish Chamber Orchestra and Trondheim Symphony. He will also perform the European premiere of Frederic Rzewski's new work at the Heidelberg Spring Festival, and return to the Wigmore Hall in recital. Next season, highlights include play-directing the Vancouver Symphony, making his debut at the Philharmonie in Cologne with Ensemble Resonanz, performing Four Seasons with the Cincinnati Symphony and Richard Egarr, returning to the City of Birmingham Symphony, and debuting with the Royal Scottish National Orchestra. His appearances in recital include Lincoln Center, Wigmore Hall, Kennedy Center, Spivey Hall, Philadelphia's Perelman Theater, and Carnegie Hall. 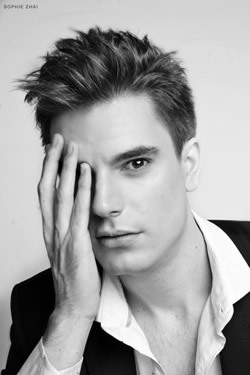 Hailed by BBC Radio 3 as “a real poet of the piano,” Andrew Tyson has a distinctive new musical voice. He was awarded First Prize and Audience Prize at the 2015 Géza Anda Competition in Zürich, and is also a laureate of the Leeds Competition. Orchestral appearance range from the North Carolina Symphony and the Orchestra of St. Luke’s at Alice Tully Hall, to the SWR Symphony Orchestra Stuttgart, Musikkollegium Winterthur and the National Orchestra of Belgium under Marin Alsop. This season includes his Wiener Konzerthaus debut and a performance with the Orchestra della Svizzera italiana under Vladimir Ashkenazy. He has given recitals in such major venues as Brussels’ Palais des Beaux-Arts, Zürich’s Tonhalle, Carnegie Hall, Piano aux Jacobins in Toulouse, the Palace of Arts Budapest and Lyon’s Salle Molière. Andrew has appeared at such festivals as Lincoln Center’s Mostly Mozart Festival, the Lucerne Piano Festival, the Dubrovnik Festival, the Festival Septembre Musical in Montreux and the Miami International Piano Festival. Andrew has performed with violinist Benjamin Beilman at the Louvre and Wigmore Hall, as well as in a major recital tour of Australia and the Heidelberger Frühling Festival. Andrew’s two CDs are on the Alpha Classics label: the first comprises the complete Chopin Preludes and the second features works by Scriabin and Ravel. After early studies at the University of North Carolina, he attended Curtis where he worked with Claude Frank. Andrew later earned his Master’s degree and Artist Diploma at Juilliard, winning the Gina Bachauer Piano Competition and receiving the Arthur Rubinstein Prize in Piano. He then went on to become a winner of the Young Concert Artists International Auditions in 2011. The Escher String Quartet has performed at the BBC Proms at Cadogan Hall and is a regular guest at Wigmore Hall. In its home town of New York, the ensemble serves as Season Artists of The Chamber Music Society of Lincoln Center and has toured with CMS to China. On its own, the quartet has also performed at Kennedy Center and the Ravinia, Caramoor and Music@Menlo festivals. Championed by the Emerson Quartet from its start in 2005, the Escher Quartet was invited by both Pinchas Zukerman and Itzhak Perlman to be Quartet in Residence at each artist's summer festival. 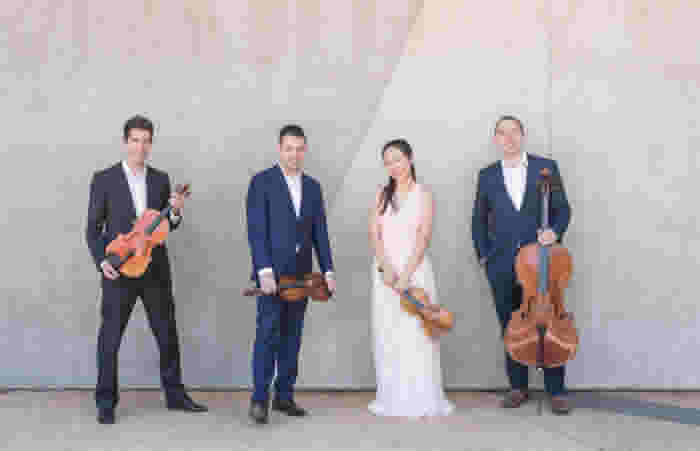 The quartet has since collaborated with such artists as David Finckel, Leon Fleischer, Wu Han, Lynn Harrell, Cho Liang Lin, Joshua Bell, Paul Watkins, and David Shifrin, and is one of the few chamber ensembles to be awarded the prestigious Avery Fisher Career Grant. In Europe, the group has performed at Amsterdam’s Concertgebouw, Berlin’s Konzerthaus, London’s Kings Place, Slovenian Philharmonic Hall, the Tel Aviv Museum of Art and the Louvre. It has appeared at festivals such as Heidelberg Spring Festival, Dublin’s Great Music in Irish Houses, Risør Chamber Music Festival in Norway, Hong Kong International Chamber Music Festival and Perth International Arts Festival in Australia. The Escher’s recordings of the complete Mendelssohn quartets have received such raves as “Eloquent, full-blooded playing. They offer a beautiful blend of individuality and accord” (BBC Music Magazine). The quartet’s Zemlinsky recordings won the Guardian’s “Classical CD of the Year”, “Recording of the Month” on MusicWeb International and a nomination for a BBC Music Magazine Award. The Escher Quartet takes its name from Dutch graphic artist M.C. Escher, inspired by that artist’s method of interplay between individual components working together to form a whole. The group is currently String Quartet in Residence at Southern Methodist University in Dallas, Texas. Cellist Jean-Michel Fonteneau is a founding member of the Ravel String Quartet, winner of the Evian String Quartet Competition and of the French Grammy Award "Les Victoires de la Musique Classique". He performs regularly with such artists as Leon Fleisher, Menahem Pressler, Gilbert Kalish, Claude Frank, Peter Frankl, Kim Kashkashian and the Tokyo Quartet. Mr. Fonteneau is currently on the faculty of the San Francisco Conservatory of Music.